Leorke, Dale and Jethani, Suneel (2015). 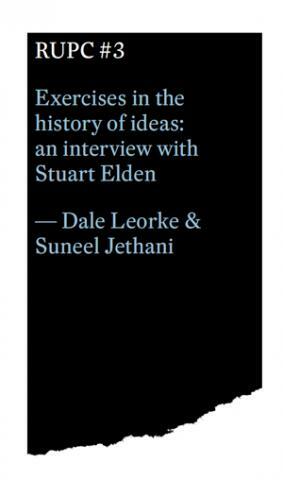 Exercises in the history of ideas: an interview with Stuart Elden. Surpllus Pty Ltd in co-operation with the Research Unit in Public Cultures, The University of Melbourne, RUPC #3 /Surpllus #13.3.
transcript as possible, and Elden has very kindly complied with this request. Most texts mentioned throughout the interview are listed in the bibliography at the end of this paper. relevance in light of the publication of his previously unpublished manuscript Towards an Architecture of Enjoyment (2014) and the widespread interest in his concept of rhythmanalysis. and develop. As might be expected, like Elden's work itself the interview is also replete with references to works from a vast terrain of disciplines, thinkers, and perspectives, both past and present.